Traditional Chinese Scoring involved playing until no more stones could be put on the board without jeopardizing life of the groups. Then the stones are simply counted. Since only stones are counted toward the score, one doesn't want to pass until all one's own territory is filled except for the two eyes required to give each group life. (The score by this style is equivalent to the modern Chinese style with a one zi "tax" per eye needed after filling in all territory. See also group tax). This definition of scoring, while different from modern rules, is interesting from both historical and theoretical perspectives, as well as for educational purposes. Here you can find a simple example game. Black: 17 + 2 = 19 points are conquered by Black. --> Black has won by a margin of 2.
, , and are virtual moves. Black: 14 + 4 = 18 points are conquered by Black. --> the game is a tie. Here, stone scoring results in a disadvantage to Black because there are more black groups than white ones. If playing Chinese scoring wouldn't black want to do something like this? The number of stones count and territory does not... I would want to fill my own territories to get more points. 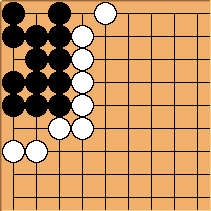 That is if it were just stones counted, but because territory includes stones and empty intersections the balance is broken between having to have an even number of black and white stones on the board. - The players don't have to really fill all their empty territory with own stones. If it's clear which intersections can be covered whenever wanted, it's enough to count the remainder after one side's territory is filled. That's similar to todays removement of dead groups, which usually is omitted as well. - The total count of moves is balanced by rule, but one side may have more stones on the board while the other one played more virtual moves. Bill Spight: It's traditional only in the sense of being older than modern Chinese scoring. Stone counting arose in the Ming Dynasty and persisted in some areas into the 20th century. John Fairbairn Bill, where are the citations that prove it persisted? And I don't think we know enough to say it arose in the Ming. Surely we only know that our earliest records of it date from then. Rather than developing from known Song rules, maybe it was a separate parallel tradition that took over in the wake of the conquest. On a general note, without in the slightest being dismissive of Ing's paper, there are some things in there that make you wonder about the rigour of his research. Anachronistic mention of tianyuan, not appearing to know old Japanese also used ro (i.e. Chinese lu) instead of me, and no mention of the Wei period. But it's a tricky area and as far as I know there has been nothing new discovered recently - hence my original query. Bill: Ing remarks that the old-timers used stone counting when he was a boy.